Adam Minoprio is a past ISAF Match Racing World Champion on the 2009 World Match Racing Tour but hasn’t sailed a regatta this year. Today he made an emphatic statement on his return to the helm. Minoprio has previously finished runner-up twice (2008, ’09) and today he had to work hard for the victory. With a southerly wind blowing around 10 knots the crews were racing the width of Hamilton Harbour. That placed the windward mark under the southern shore and in very shifty and patchy winds. 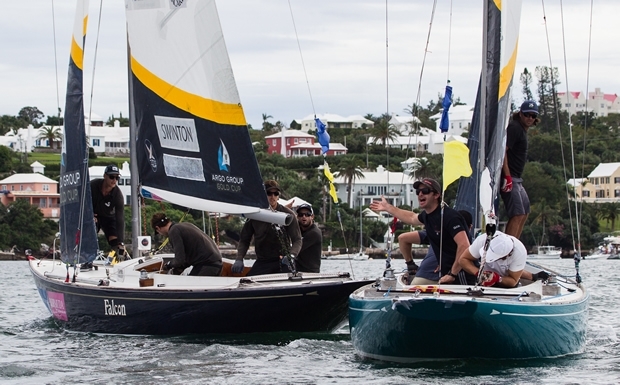 Minoprio and Swinton made the final after winning their Semi Final matches against Taylor Canfield’s US One and Björn Hansen’s Nautiska Racing, respectively. Canfield entered the final day of racing with an undefeated record (10-0) and seemingly on a course to the championship. He chose to race Minoprio because he thought that the Kiwi was rustier than the other sailors since he hadn’t match raced all year. But that decision backfired in the fifth and deciding race. Hansen beat Canfield, 2-1, in the Petite Final to win $12,000 while Canfield’s US One crew earned $11,000 for fourth place.